We'll see more systems of linear equations, inequalities, and quadratic ideas this week. Note that problems in red below have been added to the list since the last time I gave you printed copied of it. A link to the current list is below. I will try to keep this page updated to track our progress in class. See you in class! In how many ways can we form three teams of four players each from a group of 12 participants? In triangle ABC, three lines are drawn parallel to side BC dividing the altitude of the triangle into four equal parts. 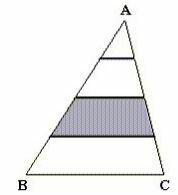 If the area of the second largest part is 35, what is the area of the whole triangle?